After 10 months of pregnancy, about 18 hours of labor and 8 weeks of adjusting to life with a new baby, this blog is back! After the birth of my daughter Morleigh on Feb 9 2012, I wasted no time getting back into the swing of things, wine-wise thanks to the magic of breast pumps! I was given a six month subscription to Wine Access magazine from my husband, downloaded the blogger app, opened an account on pinterest that is almost entirely food and wine specific (you can find me as saramantle) and I picked up the October 2011 edition of Wine Spectator just before Christmas. The feature story that month is all about the 2009 vintage of Pinot Noirs in California and the great crop of wines that came out of the Sonoma Valley specifically. It got me thinking about how little I know about, and drink, this varietal. So why not spend 2012 learning as much as I can about it, and taste various Pinots from as many different wine regions as possible, without breaking the bank? -South Africa, if I can find a good one. 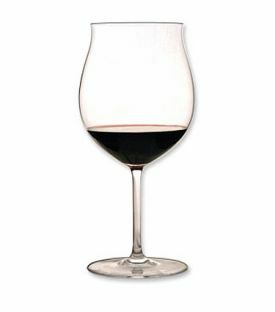 I am also aiming to try and pick wines that have a "rating" of more than 80 points in order to find very good wines that reflect the qualities of what a good Pinot Noir should be. This project is set to start over Easter weekend with the benchmark region for Pinot Noir, AOC Burgundy. According to my wine pairing wheel, a full-bodied Pinot can pair well with a roast leg of lamb. With a little help from the good people at my favorite wine store, I selected 2 bottles of Louis Latour 2009 Appellation Bourgogne Controlee. The price of each bottle in CDN was $21 each. The wine was given 86 points by Wine Access magazine, and averaged 84 points among users on snooth.com. I used the first bottle of wine in the marinade for the lamb to help soften the harsh flavor of the lamb and to help with the pairing. The lamb will be served with a Mediterranean style vegetable caponata, and paska, a traditional Ukranian Easter bread. I will also be pairing some of the Pinots I try with two other meals: one will be steaks with wild mushrooms, and salmon. Recipes and wine pairings to be determined later. Although I will likely not make it to all the wines on the above list, I will certainly make a valiant effort! If you have any 2009 Pinot Noirs that you personally recommend, especially wines from New Zealand, please let me know as this list is not set in stone. Stay tuned throughout the year as I post my tasting notes and share my experiences in my Pinot Noir project!